There are occasions on which we want a simple take-away meal, but that apparently straight-forward choice leads to a difficult choice: what sort of food should we pick; Indian, Chinese, or pizza. Thanks to Tasty Indian Pizza, our choice is made simpler; we no longer have to decide between Indian food or pizza; we can have both. 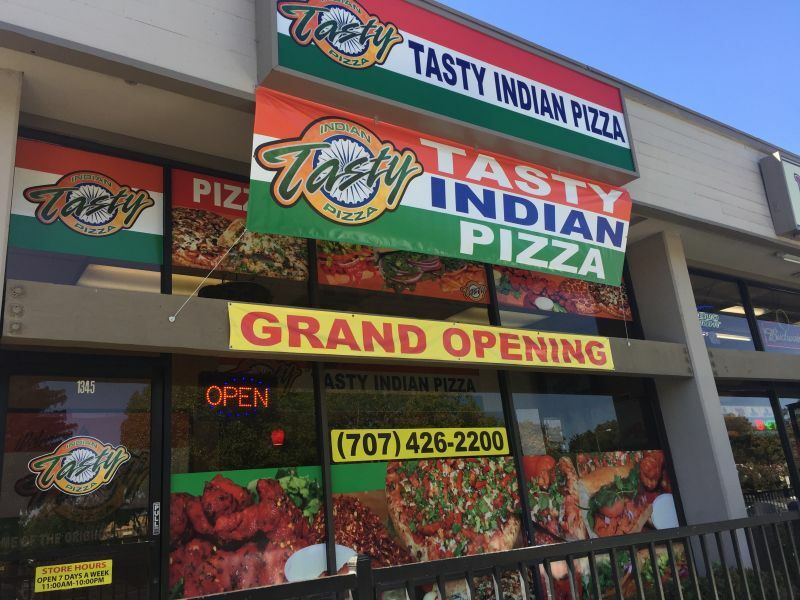 Tasty Indian Pizza is take-away only and opened just a few weeks ago. We paid a visit, bought a Hero Pizza and Tandoori wings. The Hero Pizza has butter chicken sauce, mushrooms, onion, bell peppers, tomato, chicken, cheese, and coriander (cilantro). You can see that the toppings are not that unusual compared to traditional American pizzas. The result was a well-balanced harmony of texture and flavour. The quality of the toppings was matched by generous helpings. The one part of the pizza about which I cannot comment is the crispness of the base. We purchased the pizza uncooked, as we were at the restaurant mid-afternoon and we cooked it at home later that night. California Girl’s baking of the pizza was spot-on. 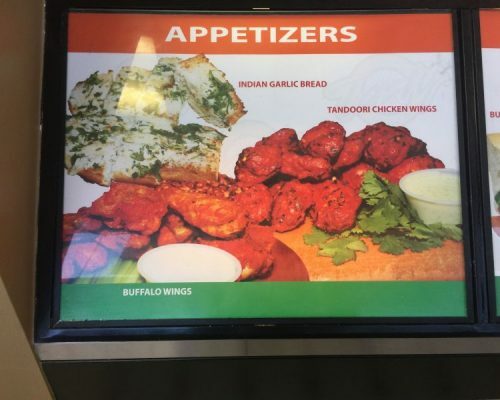 The menu includes some more traditional pizzas, Indian subs, and a mix of appetizers. 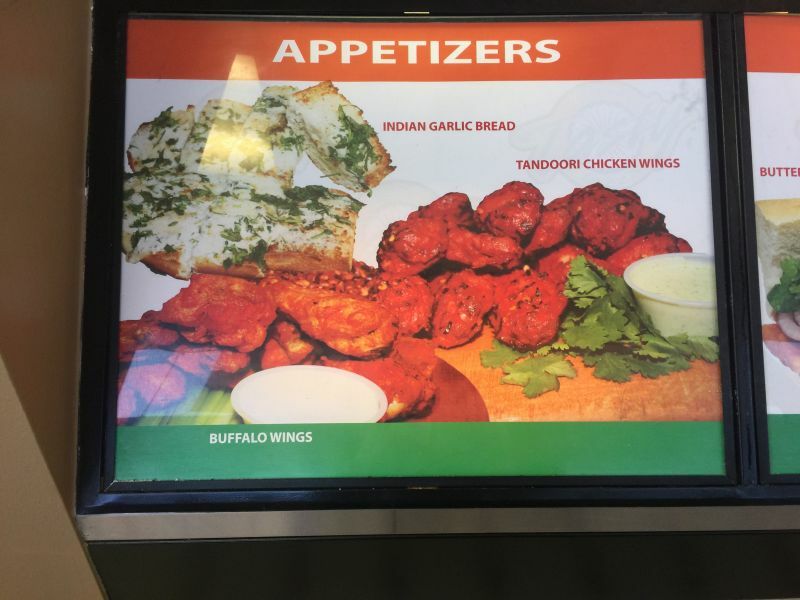 The only one that we tried on the first visit were the Tandoori wings, which had an excellent sauce that was spicy, but not overwhelmingly so. We both enjoyed the pizza, which was more than large enough for two of us. We shall certainly go back again and try some of their other dishes. I doubt we shall try the “3 Idiots”, which looks very spicy and carries a name that suggests it would be an unwise choice. Tasty Indian Pizza do not deliver, but services such as GrubHub will deliver for you as long as you place an order of at least $30. Given the prices, this will require ordering quite a lot of food.